Why are curtain rods their accompanying hardware so stinking expensive? If you dress your windows with items bought at a mid-priced store like Target, you could end up paying more for the curtain rods than for the curtains! 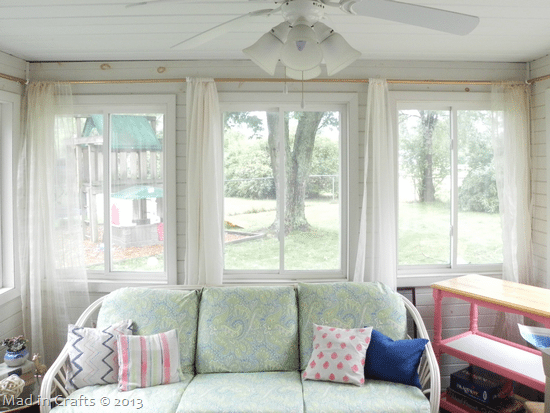 My made over sunroom has 8 windows because a sunroom kind of fails at its job if it doesn’t let in the sun. I wanted to hang sheers in the room to be able to have some privacy and because I think window treatments just make a room look finished. There was no way I was going to be able to shell out the $50+ PER WINDOW that it would have cost to buy everything from the store. 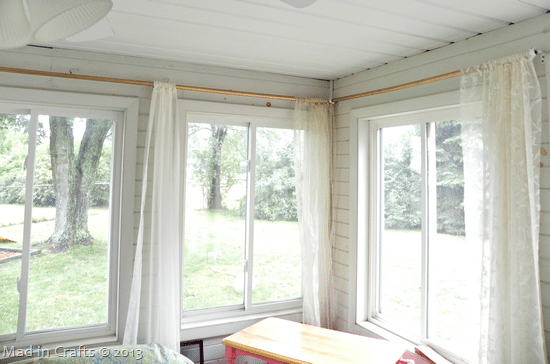 I prevented one big expense by sewing the curtains myself, and created another huge savings by DIYing the rods and hardware. I did some internet research and my dad and I were able to put up curtains all the way around the room for far less than the cost of store-bought. Use a pair of pliers to bend the outside edge of the pipe strap back toward itself in a small loop. 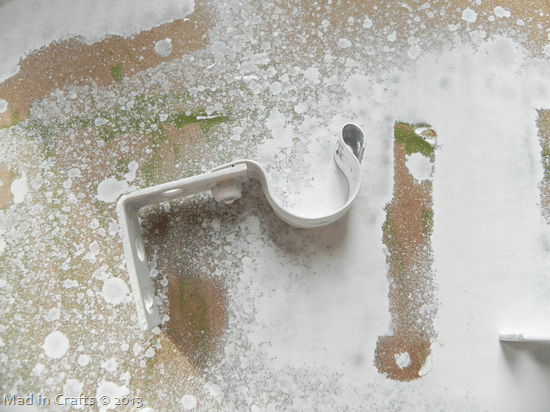 I gave the brackets a few coats of drippy white spray paint (stupid nozzle broke) and let them dry. The DIY hardware mounts to the wall like any other curtain rod hardware. 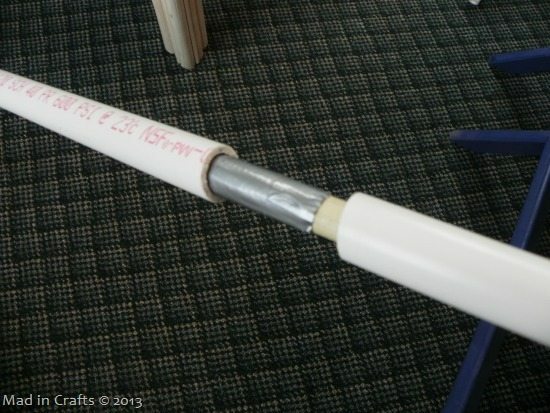 My dad used a hacksaw to cut the conduit to size, piecing together sections with wooden dowels wrapped in duct tape to prevent them from slipping. 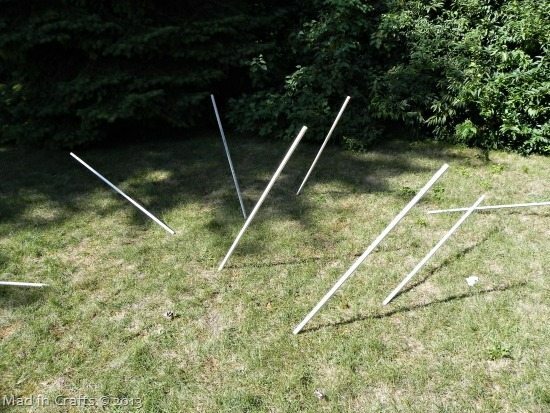 No, this isn’t a terrible art installation in our backyard, I jammed some dowels down into our lawn and put a section of PVC conduit over each, so that I could spray paint the pipe in the round. Necessity is a mother, alright. I gave the PVC a few coats of Krylon ColorMaster in metallic gold. It’s a very warm gold color that I really, really like. The PVC sits down in the DIY rod hardware, then you can pinch the pipe strap tight to secure the new curtain rods in place. 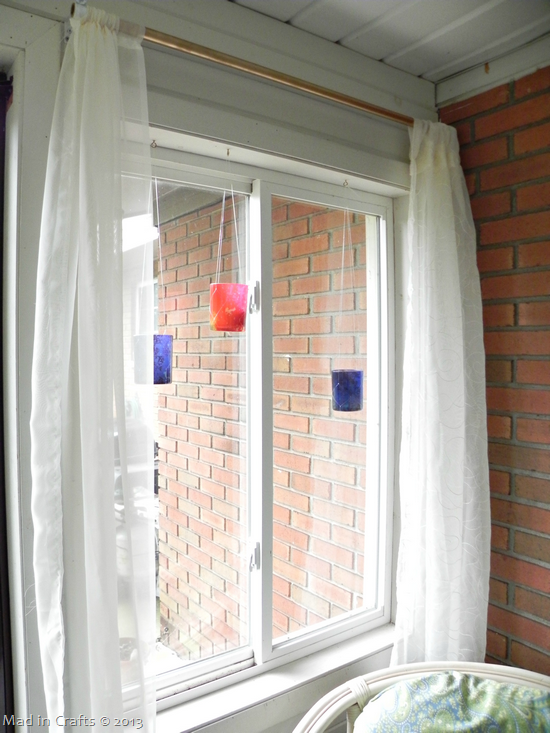 You can save a bucketful of money by making your own curtain rods and hardware, if you are willing to put in the time. Really great idea!! 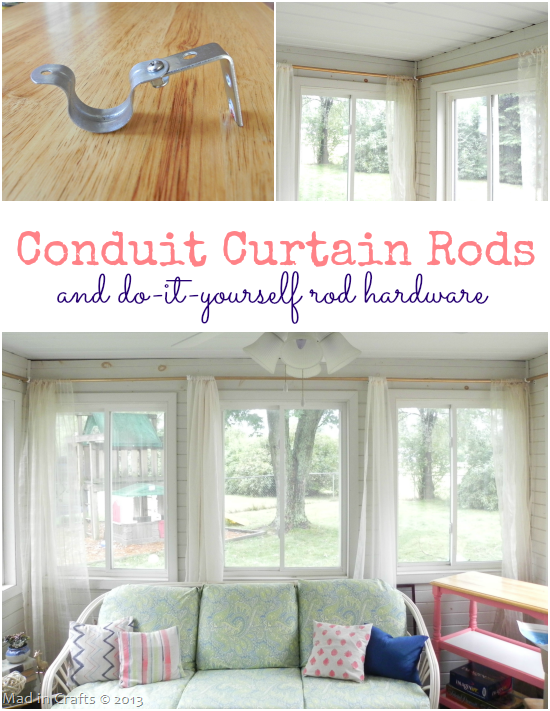 Conduit is a much cheaper alternative to regular curtain rods and in my opinion, BETTER, because it can be painted any color you choose! Thanks for sharing! Genius way to spray paint them! Exactly the help I was looking for to make it easier to spray them without spinning them and getting it all ove my fingers and smudging up the ends. I’m using the galvanized conduit but I think I can follow the same steps. I have been searching Pinterest all night for diy rods and hooks and I like this idea best because it’s so simple! Can you tell me what size of bolt and nut you used? I see that there isn’t a big long piece of bolt or screw hanging down! Thank you so much! I think it was just a 1/2 in. x 1/2 in. bolt. Hope that helps! how strong is this? I’m tired of my curtain rods getting bent up from my toddlers pulling at them. Do you think your brackets would hold up to little people running to the window and pulling open the curtains? The rods themselves seem like they would be nice and sturdy. Great idea! Thanks for the kind comment. 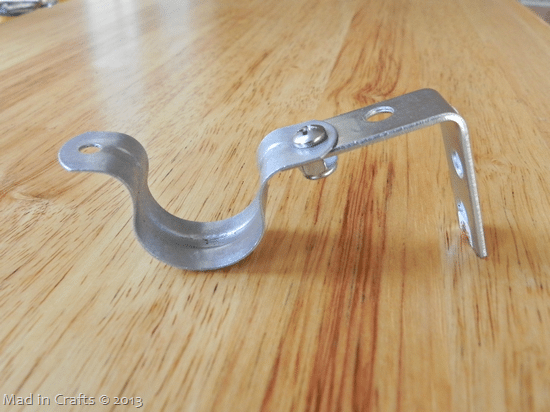 I don’t think these brackets are any sturdier than store-bought brackets, unfortunately. They would likely bend if your kids yanked on the curtains too hard. Thanks for the great tutorial on the curtain rods and hardware. I have been trying to make the swing arm curtain rods and would appreciate any ideals on the hardware to mount the rods.